We all need oxygen to survive. The same is true for babies in the womb and during labor and delivery. When a baby is deprived of oxygen even for a short while – a serious condition called anoxia – life-long injuries or death can result. The brain is particularly vulnerable to oxygen deprivation, and anoxic brain injuries are some of the most devastating and impactful birth injuries a family can experience. 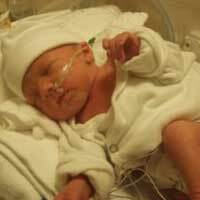 The Rich Firm, PC and its experienced team of Washington DC birth injury lawyers understand the tragic consequences of anoxia. When anoxic brain injury is the result of negligence and medical malpractice, we work with families to get them the resources and compensation they need to move forward with their lives. Anoxia is the medical term for a complete lack of oxygen. (hypoxia refers to an insufficient supply of oxygen). Babies in the womb receive oxygenated blood from the mother through the placenta and umbilical cord Anoxic brain injuries occur when a problem with the delivery of oxygen to the child’s brain stops cuts off the supply of oxygen entirely. A child’s brain cells are extremely sensitive to oxygen deprivation; those cells will begin to die within minutes without a supply of oxygen. After five minutes without oxygen, permanent anoxic brain injuries or death can result. If not discovered and addressed immediately and aggressively by delivery room staff, anoxia can cause irreparable and life-long health problems, including cerebral palsy, brain damage, epilepsy, or developmental disabilities. While the causes of anoxia may not be the result of any errors on the part of physicians or delivery room staff, anoxic brain injuries caused by their failure to detect and treat an anoxic child can be. Close observation of the mother’s and the baby’s vital signs, including fetal heart rate monitoring should alert physicians and staff to any problems with the baby’s oxygen supply. However, if the delivery room staff fail to recognize anoxia, the seconds and minutes that go by without immediate emergency measures being taken can lead to the child’s death or a lifetime of challenges for the child and his or her family. When mistakes are made during labor and delivery, the consequences can be life-changing. Fewer mistakes are more impactful and tragic than anoxic brain injuries caused by a physician’s failure to recognize and immediately treat an anoxic child. If your child suffers from cerebral palsy, developmental disabilities, or other conditions that may be the result of oxygen deprivation and anoxia during childbirth, we can help.